As the year turns towards Thanksgiving here in The United States we begin to dust off favorite recipes and think of favorite foods. As there is less and less to occupy our time out in the garden, some of us turn back to the kitchen and enjoy projects a little more involved than hot coffee, tossed salad, and stir fried vegetables for dinner. I have always loved good bread and the rich way it smells when baking. I remember the peculiar smell of rolls baking on a German passenger ship when I was a child. They were unbelievably delicious with fresh sweet butter. Each country and continent seems to have very distinctive bread based on the grain it raises. I was raised mostly on supermarket loaves and rolls, and one of my life’s ambitions was to learn to bake good bread in my own kitchen from yeast, water, salt and flour; no mixes or machines involved. If you also love good bread, allow me to recommend the books by Dr. Jeff Hertzberg and Zoe Francois, Artisan Bread in Five Minutes A Day and Healthy Bread in Five Minutes A Day. The good doctor and his friend the pastry chef have developed a wonderful method for making bread at home with a minimal investment of time and effort, using only fresh, healthy ingredients. This method is easy, does away with lengthy kneading, and offers recipes which actually improve with time as the dough rests in the refrigerator for up to a week. The recipe I’m offering in this post is my personalization of the recipe for Stollen which Hertzberg and Francois published in their Healthy Bread book. Michael published a beautiful recipe for his Christmas rum cake on his blog earlier this week, which reminded me of this delicious rum scented holiday bread. I’ve made the recipe many times over the last few years in late December, giving away most of the loaves to friends and family. 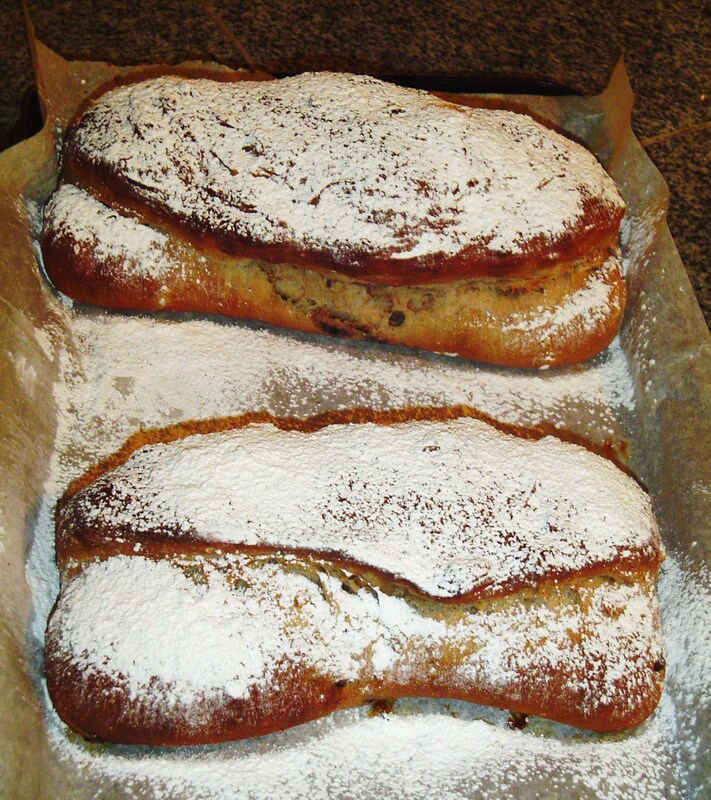 My dear friend was coming for tea this afternoon, and so it seemed a good day to make this Stollen, photograph the steps, and share the recipe with you. When you go to this much effort, it makes sense to make a large quantity at once. This recipe makes four large loaves. You could certainly divide the dough for one of the loaves into 6 or 12 portions and bake them in a muffin tin as small breakfast rolls. You could also leave out the almond paste filling and bake the dough as a traditional loaf. I baked these loaves today with all white bread flour. You could ramp up the nutrition by substituting whole wheat flour for some of the white. This is a very heavy, enriched dough. If you choose to use whole wheat flour, please also add in the Vital Wheat Gluten called for in the variation in the recipe. Bread flour has a much higher gluten content than all purpose flour, and so allows the bread to rise more. The gluten is the protein which gives bread its structure. Whole grain flours have less gluten than white, and so adding additional gluten into the whole grain flour allows the loaf to rise as though it was made only with bread flour. 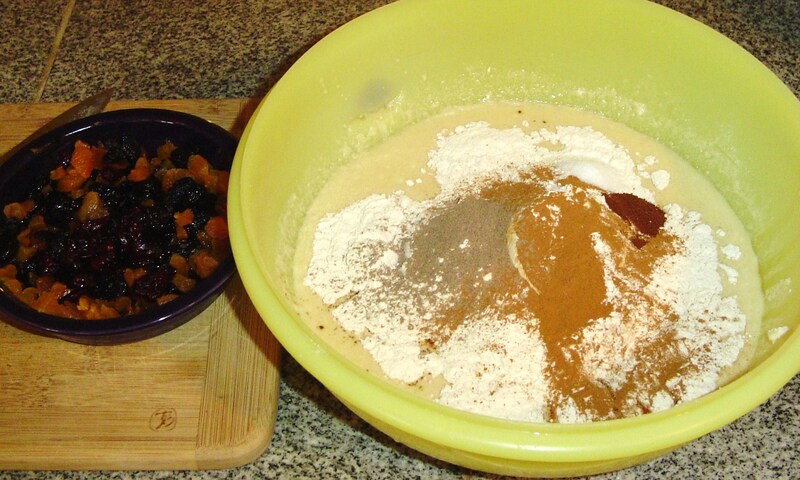 The gluten must be mixed into the dry flour before the flour/gluten mixture is combined with any wet ingredients. Bob’s Red Mill makes a beautiful gluten product usually available wherever that brand is sold. It is also available online. “Enriched dough” means that you’ve added eggs, fat, dairy, and sweetener to the basics of flour, salt, water, and yeast. 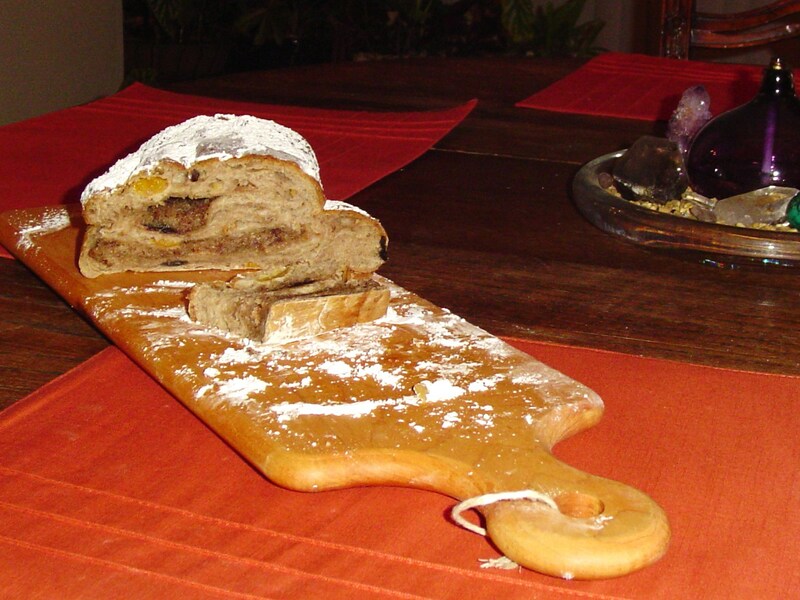 Many European style breads, especially for the holidays, are enriched breads. They have a different aroma and texture from a basic Italian bread or sandwich bread. They are chewier, softer, sweeter, and mildly fragrant. The almond meal called for in the filling is also available from Bob’s Red Mill, but I buy it at Trader Joe’s. You certainly could begin with raw almonds and grind up your own in a food processor or food mill. You could also purchase Marzipan at the grocery and use it instead. Otherwise, all of these ingredients are very easy to find. 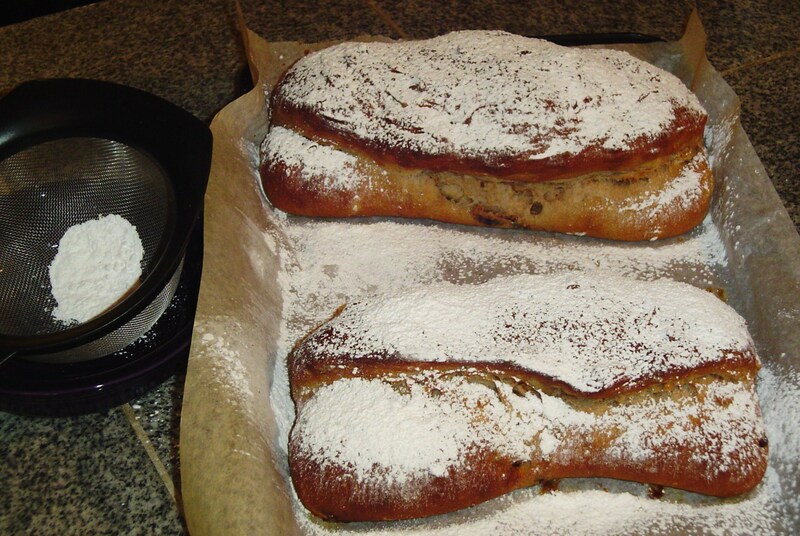 So, here is my recipe for rum laced Stollen bread. 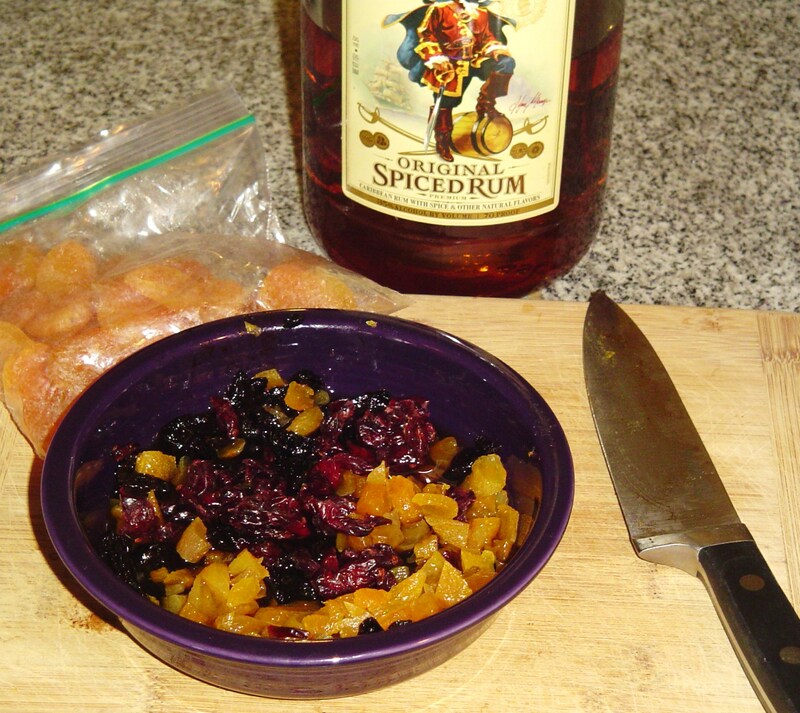 Feel free to make it without the rum by soaking the dried fruit in fruit juice, or even warm black tea, to plump it up before mixing it into the dough. If you don’t soak it first, it will draw too much moisture out of the bread and your finished loaf won’t be as light and moist. Enriched dough includes eggs, butter, sweetener, and milk. The batter looks golden because it has two whole eggs and 1/2 c. honey already mixed in. Toast 1 cup of walnuts, pecans, or filberts in a 350F degree oven until fragrant. 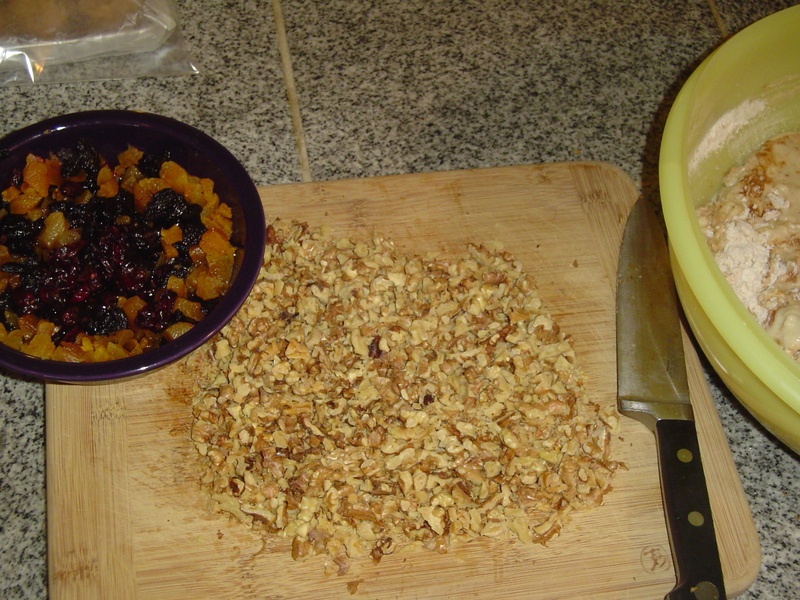 Roughly chop the nuts and set aside. Mix the spices and salt into the flour before mixing into the wet ingredients. 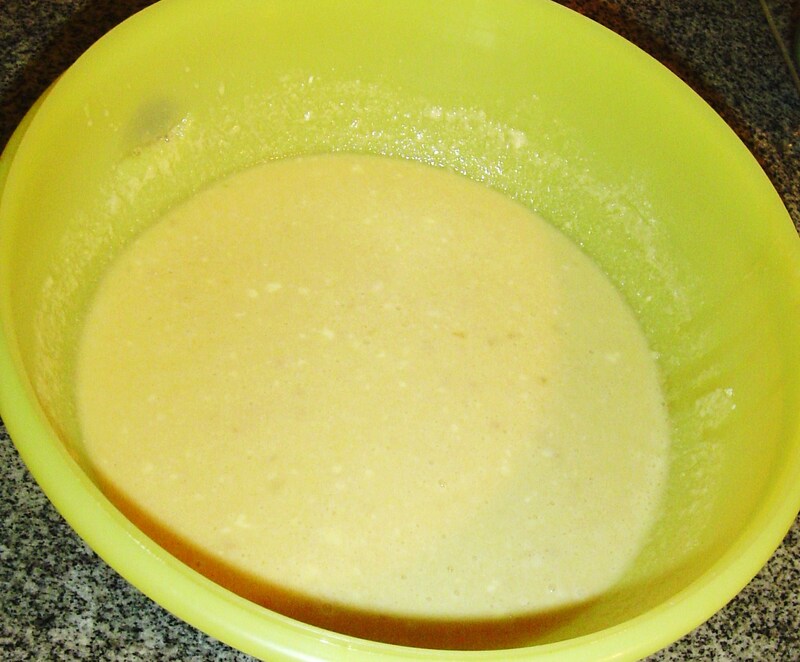 In a very large mixing bowl, combine 2 c. warm water, 1.5 TB dry yeast, ½ c. honey, and 1 c. bread flour. Whisk to combine. Stir in 2 beaten eggs, a cup of half and half or coconut milk, and 1/3 c. melted butter. Measure 3 more cups flour onto the liquid ingredients. Before stirring, measure 1 tsp. salt, 1 TB ground cinnamon, ¼ tsp. ground cloves and ½ tsp. cardamom onto the flour. 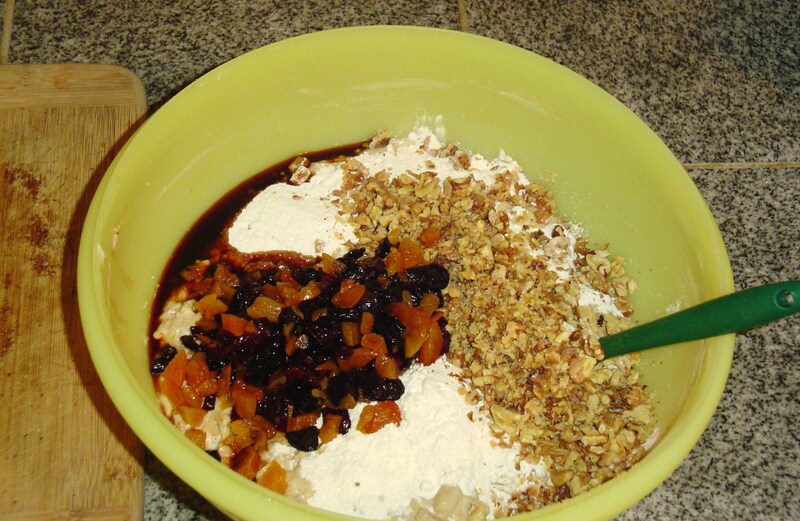 Mix the fruit and nuts with flour before mixing them into the dough so they are well separated and suspended in the final dough. Combine dry ingredients gently with a rubber spatula, and then stir them into the liquid to form a very loose dough. 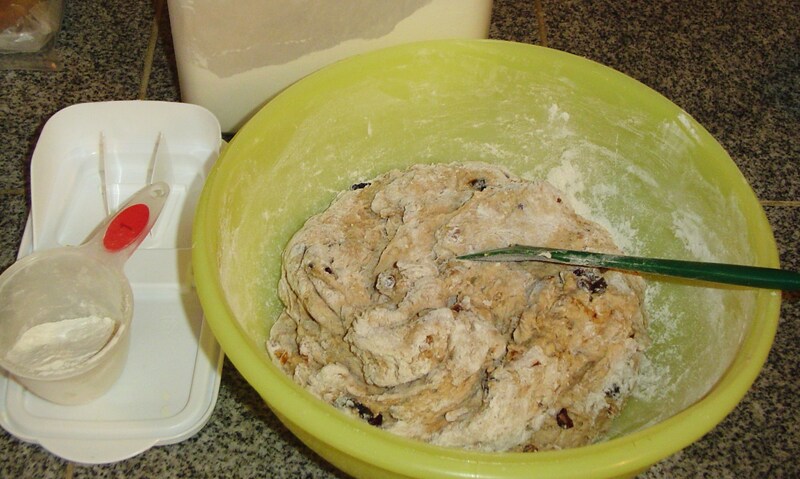 Pour the fruit and remaining rum onto the dough along with the chopped nuts, and top the fruit with another cup of flour. Gently mix the flour with the fruit and nuts, and then fold into the dough with strokes from the sides of the bowl into the center. 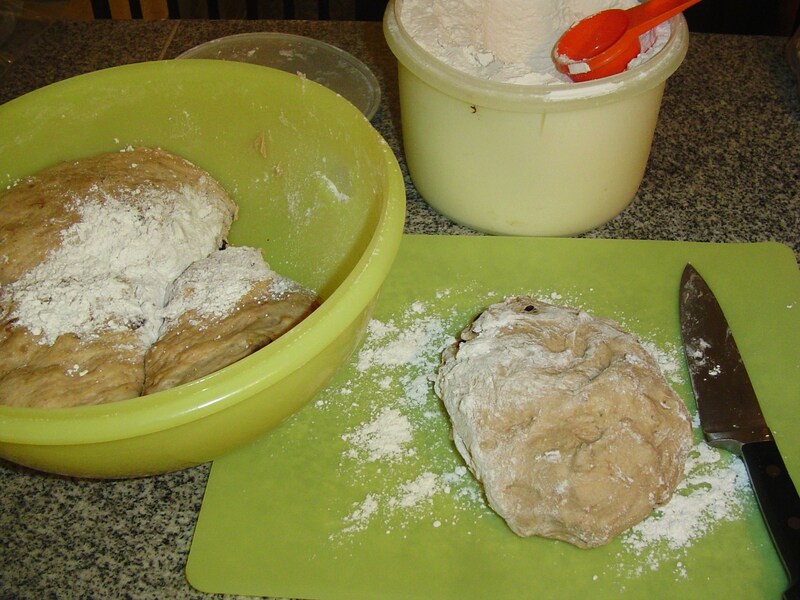 Add additional flour, 1/2 c. at a time, until the dough forms a ball and is no longer wet. Fold the dough over from the edge of the bowl towards the center to stir in the flour. Cover the dough with a sheet of waxed paper and a damp kitchen towel and allow it to sit in a warm place in the kitchen until it doubles in size, about 2 hours. 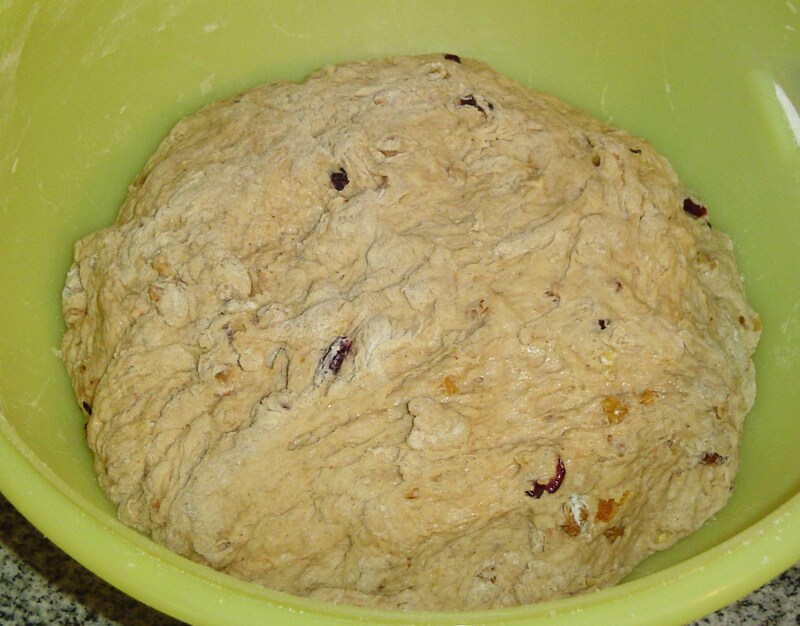 This dough is ready to cover and allow to rise. Either form the dough into loaves immediately, or cover the dough with plastic wrap and allow it to continue to develop in the refrigerator for up to 5 days before baking. The dough is easier to work with if it sits in the refrigerator for at least 2 hours before forming the loaves. 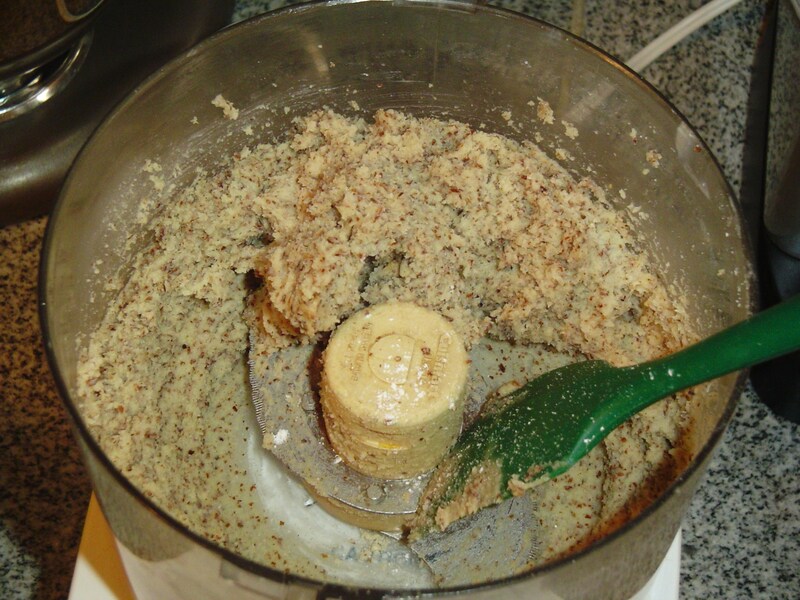 Combine 2 c. ground almonds, 1 c. confectioner’s sugar, and 1 stick of softened butter (1/2 c.) in the bowl of a food processor fitted with the blade. Process to combine. Add 1 tsp. of almond flavoring and ½ tsp. of pure Vanilla extract and process until smooth, scraping down the sides of the bowl from time to time. Use immediately, and refrigerate any leftover almond filling in an air tight container. Allow to warm to room temperature before using again. Cut the dough into four portions with a floured knife. 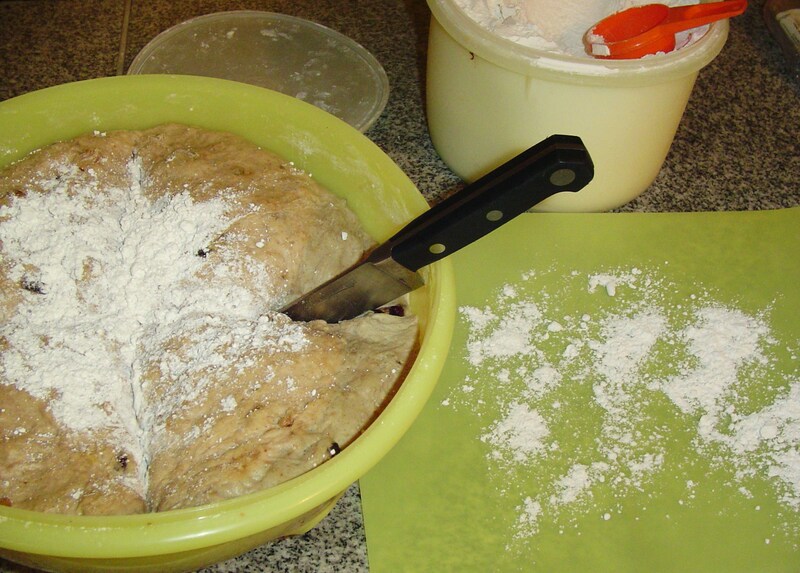 Sprinkle the top of the dough with flour, and plunge a large knife into flour to coat it. Sprinkle 1/8th cup of flour onto your work surface. Cover a large baking sheet with parchment paper. 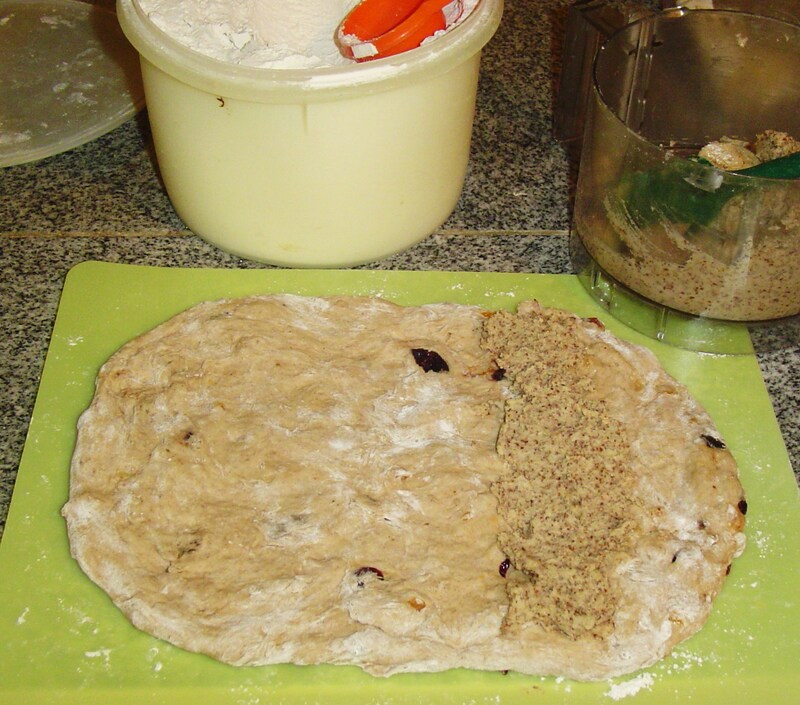 Cut the bowl of dough into 4 fairly equal portions, and remove one portion onto the floured work surface. The dough will be sticky, so coat all sides lightly in flour, and gently form into a ball. Stretch and push the dough into a large oval, about 12 x 14”. 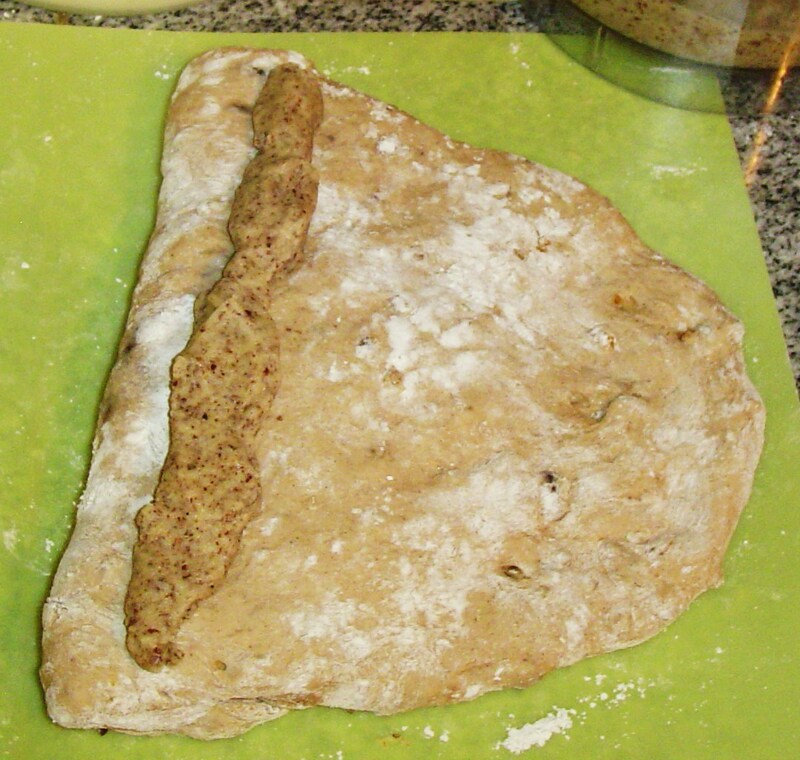 Form about 1/3 c. of almond filling into a long rope the length of the short side of the dough (about 11”) and place it about 4” in from the right edge. Lift the other side of the oval and drape it over the almond filling. Form a second rope of filling and place it on the dough, about 3” in from the left edge. Lift the free end of the oval and drape it back across the filling towards the left. You will have a loaf 3 layers of dough thick, folded accordion style. Gently transfer the loaf onto the parchment covered baking pan. Repeat with the other 3 sections of the dough to make up to 4 loaves. The dough can be refrigerated for up to 5 days if you decide to bake only part of it at a time. These loaves have risen for 40 minutes, and have been brushed with an egg wash. They are ready to bake. Proofing and preparing to bake. Cover the loaves with a sheet of waxed paper and allow them to rise for an additional 30-45 minutes if the dough was room temperature, 60-75 minutes if the dough was chilled. 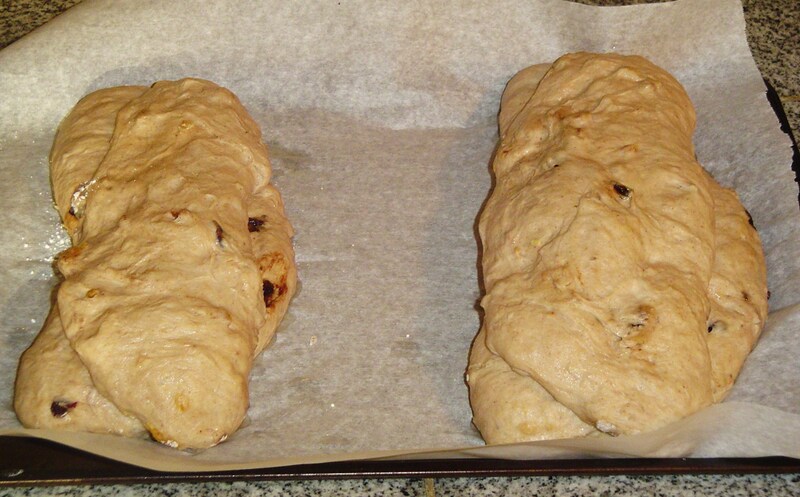 Placing the loaves in a slightly warm or unheated oven will speed the process. (Remove the loaves from the oven) Preheat the empty oven to 400 F. Whisk an egg white with 1 TB of water, and brush on to the loaves just before putting them into the oven. Bake for 30-40 minutes until the loaves are nicely browned. Cool the finished loaves on a rack, and dust with confectioner’s sugar before serving. The loaves slice best when allowed to cool completely. Still warm, and with a cup of chai, these beautiful loaves are a heart warming treat. They are especially good served with sharp cheddar or a savory cream cheese spread. 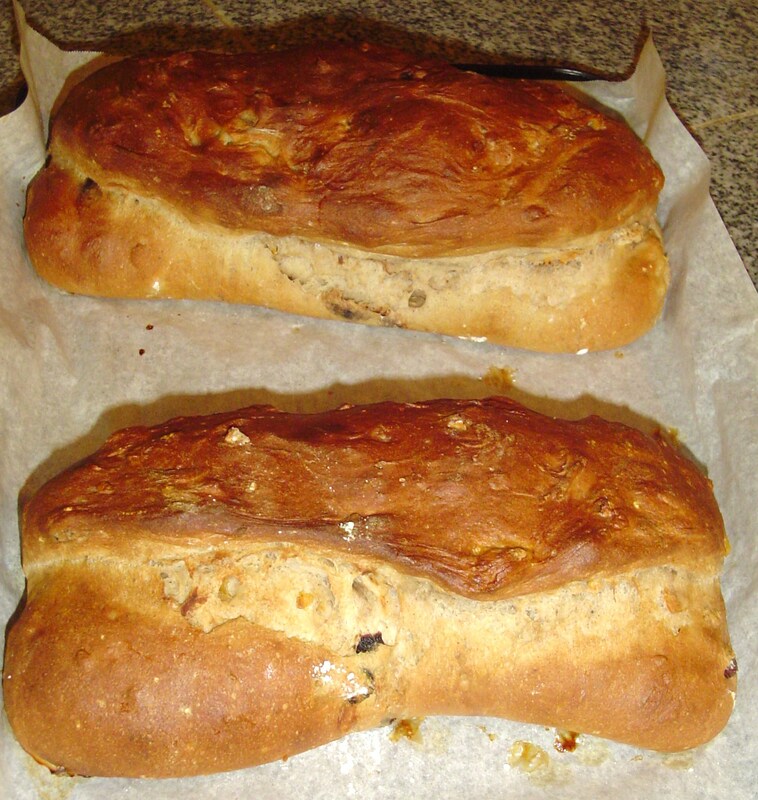 Please don’t wait until Christmas to make these beautiful fruit and nut studded loaves for your family. 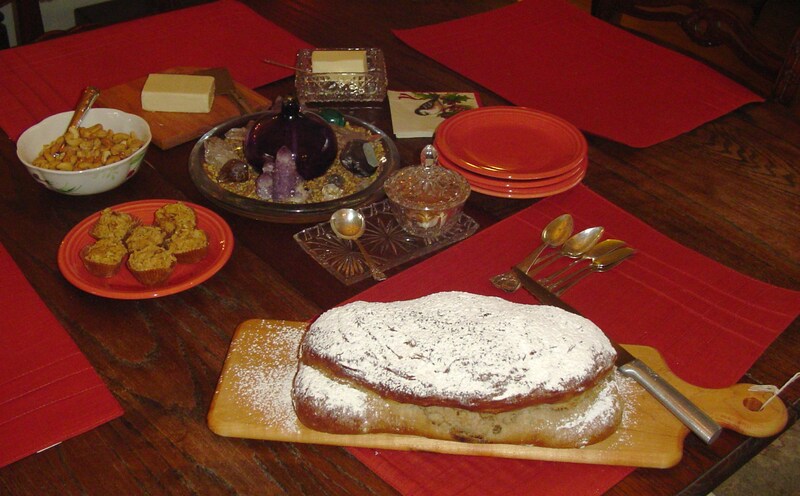 Celebrate this season of abundance with healthy bread, filled with nuts and dried fruit, beginning now.